Breakfast is the most important meal of the whole day. 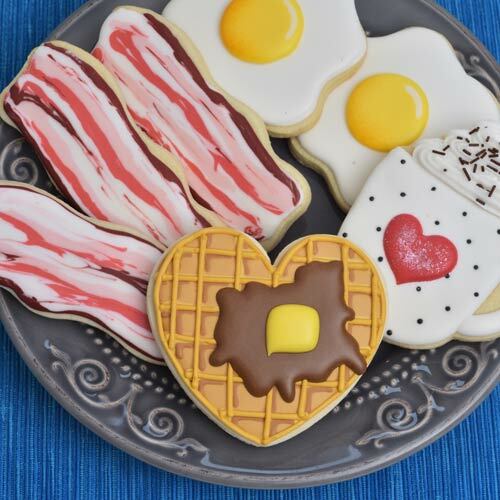 Let’s make Breakfast Cookies : Waffle, Bacon,Egg, and Coffee with Whipped Cream. What’s your perfect breakfast? This Breakfast Cookies tutorial includes a video. Scroll down for tools, recipes and a video used to make Breakfast Cookies. I made egg yolk part as royal icing transfer. 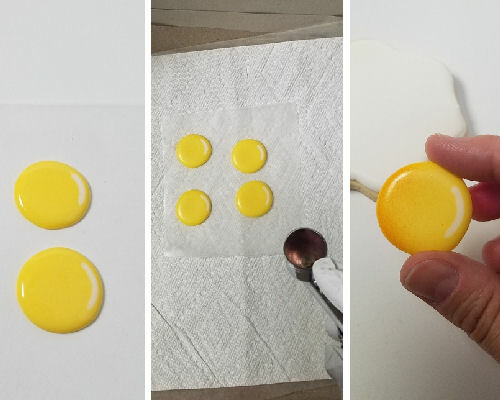 Make egg yolk as royal icing transfer. Pipe yellow royal icing rounds on a piece of food grade acetate or wax paper. Create reflection while yellow is still wet. Let dry. Then using orange airbrush color airbrush the edges. Peel the wax paper and egg yolk is ready. 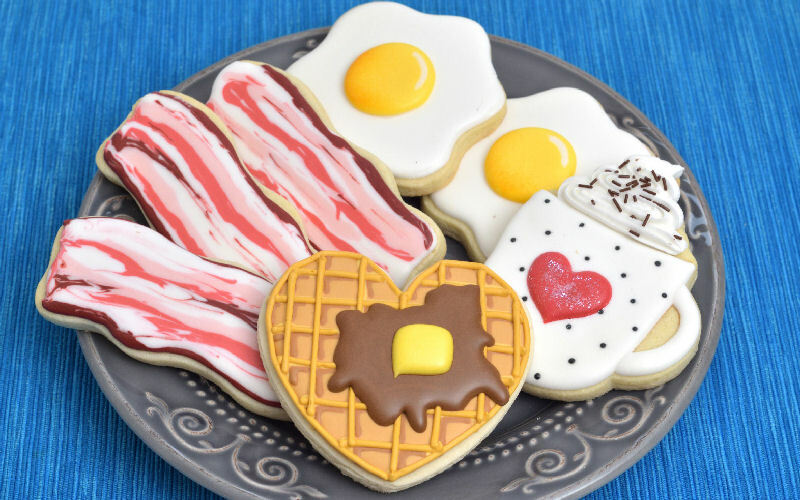 What kind of breakfast cookies would it be without a bacon?! 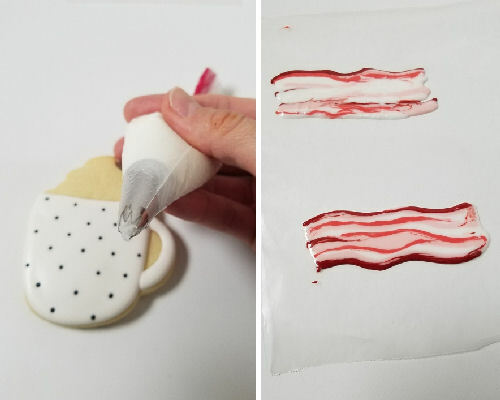 Bacon can seem daunting to make and so if this is the case for you, try decorating a piece of wax paper first. It never hurts to have a rehearsal before the premiere. Darkest redish tone was achieved by adding a little bit of fuschia and a touch of brown to red royal icing. Light pinkish tone is basically pink with a touch of ivory to mute it down a bit. Medium red is light colored red icing with a touch of ivory. I also used white royal icing. To pipe with a star tip icing has to be somewhat thick, if you find that icing is too fluid, you can try adding little bit of sifted powdered sugar to it. 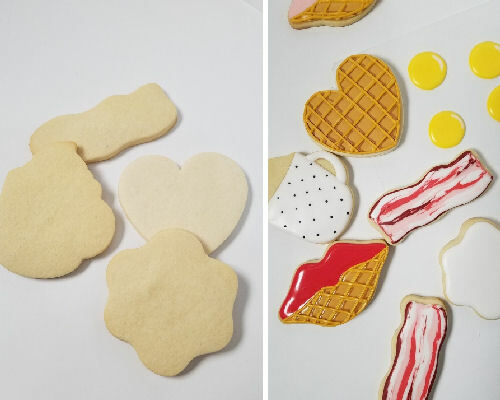 These waffle cookies are really easy and fast to create. I used wet on wet technique to make the base and then all I had to do is add the top grid with piping consistency royal icing. I used wet on wet technique to create the grid and the brown shading and then I piped the main, slightly raised grid on the top. Then chocolate syrup is piped after the base has crusted well. Wait about 20 -30 minutes before adding the butter. Main and raised grid is the same color combo as 1st layer except I added a tough more yellow to it. Chocolate syrup is basically brown food coloring. Butter color consists of yellow a sublime amount of orange. Olá, gosto muito do seu canal. Continue a fazer-me sonhar. Fiz uma publicação no meu blogue com um link de um dos seus vídeos. Espero que não se importe com esta humilde bloguer. Caso não concorde com a publicação que fiz, diga-me que eu retiro do blogue. Obrigado por me avisar, basta ligar de volta para o meu blog. Obrigado.